Influencer Marketing is estimated to be a $6.5 billion-dollar market in 2019. More businesses are teaming up with influencers to get their products or services in front of their target audience. Join us on March 28th to network and to learn about influencer marketing from two perspectives: the influencer and the business. 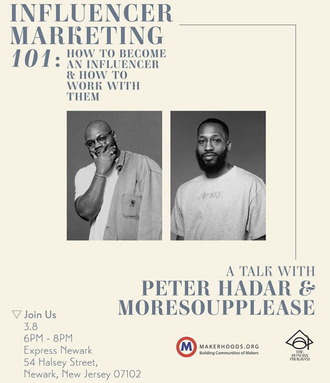 Hear from emerging influencer MoreSoupPlease in a moderated discussion with Peter Hadar. MoreSoupPlease is an upcoming NYC DJ and photographer. He has authentically grown his Instagram following to open up new business opportunities and partnerships. Peter Hadar is the managing Owner & Creative Director of The Honors Program, a brand strategy multimedia company specializing in event programming and artist management. He is also the producer of the Guard d'Avant Progressive Music Festival. Following the panel discussion, you’ll have a chance to promote your business during our “Show & Tell, Ask & Gives” portion of the event. 7:15 – 7:30: Show & Tell, Ask & Gives – Time to make meaningful connections with fellow attendees. Each attendee can get 30 seconds to promote their project or business, seek advice from fellow attendees, or offer your skills to the group. After sharing, attendees can find each other and network directly. Google Livestream: SEO Like a P-R-O!